Unique Villa just 20 min. away from Amsterdam, next to the river de Vecht! 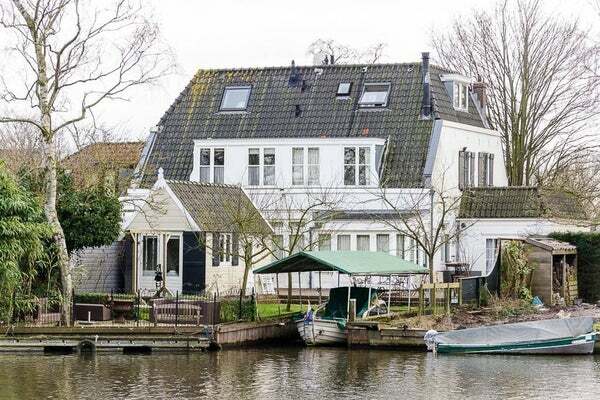 Recently renovated villa from 1905, with private dock for boat and bathing jetty in its own garden on the Vecht river, in a unique location in the picturesque village of Vreeland. 4 bedrooms, guests - au pair house, 3 bathrooms, 2 living rooms. Vreeland is a picturesque village, situated on the Vecht river, 15 minutes by car from Amsterdam, Amstelveen and Utrecht, 20 minutes by car from Schiphol. Uitvalsweg A2 is 5 minutes by car from the house (approx. 4km). In Vreeland there is a supermarket, various restaurants and a primary school. Loenen aan de Vecht is the neighboring village with various shops, primary schools, restaurants, hockey and tennis club and golf course Old Course Loenen. Beautiful living / dining kitchen in English style with antique details and doors to the back garden on the Vecht side, overlooking the river 'De Vecht'. French sandstone floor with underfloor heating, Belgian hard stone countertop and antique fireplace. Spacious living room with double doors to the garden adjacent to river 'De Vecht', large antique sandstone fireplace. Spacious adjoining study or dining room with antique fireplace and plenty of cupboard space. Solid oak flooring. 1st Floor: separate toilet, large master bedroom with fitted wardrobes and breathtaking view of the Vecht, 2 bedrooms, very luxurious bathroom with bath, double washbasin and shower. 2nd Floor: 2 bedrooms, bathroom with an antique bath, shower and toilet, separate laundry room with washing machine and dryer. Guest house with toilet, shower, kitchen and bed in the garden.